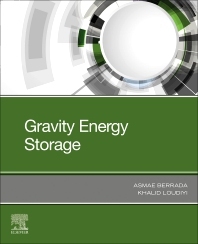 Gravity Energy Storage provides a comprehensive analysis of a novel energy storage system that is based on the working principle of well-established, pumped hydro energy storage, but that also recognizes the differences and benefits of the new gravity system. This book provides coverage of the development, feasibility, design, performance, operation, and economics associated with the implementation of such storage technology. In addition, a number of modeling approaches are proposed as a solution to various difficulties, such as proper sizing, application, value and optimal design of the system. The book includes both technical and economic aspects to guide the realization of this storage system in the right direction. Finally, political considerations and barriers are addressed to complement this work. Asmae Berrada is a professor in the school of renewable energy at the international University of Rabat (UIR). She holds of a PhD degree from the Facultyof Science at SMBA University in Fez. Her PhD work was prepared at Al Akhawayn University within the framework of the EUROSUNMED project (Euro-Mediterranean Cooperation on Research & Training in Sun Based Renewable Energies). She obtained a Master degree of Science in Sustainable Energy Management, and a Bachelor degree in Engineering and Management Science from Al Akhawayn University. Dr. Berrada started her career as a part-time faculty at Al Akhawayn University from (2014 to 2018). She has received a number of research awards and honors such First Prize for Talent Award in Research and Innovation by Masen in 2018 and Best PhD thesis by SMBA. She has published a number of articles in peer-reviewed journals and has been a reviewer for several international journals known in the field of Energy. Her main research focus is on energy systems and their modeling. She has actively been working in the area of energy storage. Professor Khalid Loudiyi has been a faculty member of School of Science and Engineering at Al Akhawayn University in Ifrane (AUI), Morocco, since 1995. He joined AUI after spending five years (1089-1994) at Ibn Tofail University in Kenitra, Morocco, and one year as a visiting assistant professor at Oklahma State University. Professor Loudiyi holds a PhD degree in Physics from Oklahoma State University. During his academic career, he has established different academic programs at AUI and Ibn Tofail University. For the past ten years, he has been working on different renewable energy projects. Among his contributions, at AUI, in this area are the setting up a Master of Science degree in “Sustainable Energy Management”, and starting major renewable energy projects in energy storage, solar energy, wind energy and energy efficiency.